Greg Autry, Jennifer Zheng (former Chinese labor camp and torture victim, author of Witnessing History and star of Free China), and Hon. 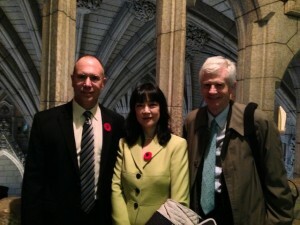 David Kilgour at Parliament on Friday 11/2/2012 before the Death by China showing. Today’s guest post is by the Honorable David Kilgour, former Canadian Member of Parliament, former Secretary of State for Asia, and a Nobel Peace Prize Nominee. David and I had the opportunity to discuss many things in Ottawa this weekend and we spent a lot of time on the American election. As a thoughtful moderate and a fan of Mr. Obama concerned about human rights in China and jobs in North America, he was torn. His thoughtful insights are reflected here. From all indications, most Canadians would vote to re-elect Obama president tomorrow if we could, just as we would have done in 2008. One opinion survey four years ago indicated that as many as 92 per cent of us favoured Obama-Biden over McCain-Palin. The pre-election endorsements of Obama by Colin Powell, Michael Bloomberg and the Economist magazine, all of whom might have been expected to endorse Romney, will make the comfortable choice even easier for many Canadians. There are many qualities we like in Obama, including his intelligence, compassion, surmounting of early upbringing obstacles, and his family. Both his books, Audacity of Hope and Dreams from my Father, are compelling. In short, many Canadians continue to have confidence in the president and to extend him the benefit of various doubts since he moved to the White House. Mitt Romney, despite having a family cottage in Canada and thus more direct exposure to our country as a youth, is harder for many of us to identify with. He epitomizes the much-criticized 1% in a difficult economic period for many across America, Canada and the world. He is also obliged to accommodate the Tea Party faction in the Republican party, essentially contemporary political Know Nothings, who have made it difficult for him to be what he undoubtedly is: a Massachusetts moderate. The New York Times columnist, David Brooks, recently offered some interesting predictions about the kind of administrations each candidate would offer. Obama would probably seek to enact the sensible program he recently laid out in an interview: recreate the budget deal of two years ago ($2.50 of spending cuts for every $1 in tax increases); cuts in corporate taxes as part of business reform ; attempted immigration reform; implement Obamacare; increase spending on infrastructure. The rest would be about smaller items, such as more math and science teachers and increased foreign affairs initiatives to build a legacy. Romney would begin with the conviction that the status quo is unsustainable: the mounting debt is ruining America and “byzantine tax and regulatory regimes are stifling innovation and growth.” Under a Romney administration, Brooks thinks the federal government would spend about 21 per cent of the G.D.P. instead of about 24 per cent. Importantly, Romney would respect the main lesson of the election campaign: moderation wins. Among other lessons, this means he’d have to increase taxes on the rich, reduce his tax-cut promises and abandon the draconian spending reductions in his running mate Paul Ryan`s budget proposals. In short, for Brooks, an Obama win probably “means small-bore stasis; if Romney wins, we`re more likely to get bipartisan reform…He`s more likely to get big stuff done”. While foreign policy is one of Obama’s perceived advantages over Romney, he has certainly fumbled some major issues abroad, including climate change and the Doha Round of world trade negotiations. Whether Romney or anyone could have done better internationally as president is an open question, especially during a global economic crisis and the rise of new players on the world stage. Among Obama`s accomplishments are his ending of George Bush’s “global war on terror”, removing American soldiers from Iraq, and his handling of the Arab Spring in some countries. On other issues–Iran, Afghanistan, Russia, Pakistan, North Korea, the Israeli-Palestinian conflict come readily to mind — there have been few strategic gains. There is enormous but little-focused-upon-by-the-media concern about China and the continuing loss of manufacturing jobs across the United States. As a consequence, only about nine percent of Americans now work in the sector, when probably at least one quarter are needed for a successful modern economy. It is disingenuous for Obama and business CEOs to brag that America exported $100 billion last year to China when it imported almost $400 billion. Beijing cheats on most of its World Trade Organization commitments, but its continuing manipulation of its currency is doubtless the most destructive in terms of good jobs disappearing in America, Canada and all countries trading with China. Romney is right about the urgent need to declare China a ‘currency manipulator’ and to add 20, 30 or whatever percentage the tampering is determined to be to the price of every import from China. On reversing the problems affecting America, Canada and so many economies, which candidate is better equipped? Martin Wolf, one of the world’s leading financial columnists, identifies some clues. At the end of Obama’s first year in office, the world was on a path very similar to the calamitous one taken in the 1930s, but managed to adopt policy responses that included expansive monetary and fiscal policy and support to the financial sector. Wolf believes that a debt crisis inside the U.S. and a meltdown of the Eurozone are today the most likely triggers for another major crisis. He adds that there is no consensus today on what is the “right macro policy-that is the right monetary policy, the right fiscal policy, and the right policy on dealing with debt overhangs.” Whichever candidate has convinced more Americans that he can restore the American economy and get back to reasonable employment levels and growth is likely to win tomorrow. Very reluctantly, and primarily because of Obama’s weak stand on jobs/China, I’d vote for Romney. China has given much to the world during five millennia. My own respect for its people grew during several visits to the country; it was an honour to represent some Canadians of origin in the Middle Kingdom for many years in Parliament. To illustrate the difficulties of such engagement with Beijing, take the case of Bo Xilai, whom many democratic governments and business people courted even after it was clear that he was on his way out of the Party. Canada’s prime minister met with him in Chongqing city on Feb. 11, nine days after his former police chief, Wang Lijun, sought refuge in the U.S. consulate in Chengdu. Bo and Wang had earlier been among the most brutal persecutors of Falun Gong practitioners. Premier Wen Jiabao was so troubled by Wang’s conduct that his rhetorical question to Party members appears to have been leaked from a closed meeting on March 14, “Without anaesthetic, the live harvesting of human organs and selling them for money-is this something that a human could do?” Wen also used the many lawsuits launched against Bo in 13 countries for his role in organ pillaging to have him removed as Commerce Minister in 2007. Bo, Wang and others were members of former president Jiang Zemin’s faction in the Party, who rose because they supported Jiang’s brutal persecution of Falun Gong ongoing from mid-1999 to the present day. Your State Department, for example, has known about the pillaging of organs from Falun Gong at least since 2006, but only in May, 2012 acknowledged the well-documented crime against humanity in its human rights country reports. Democratic governments should be supporting Wen and reform-minded party members on this and a host of governance issues. The methods of Mao did not perish with him in 1976. In 2003, for example, the Party sought to hide the impact of the deadly SARS virus. Only when a doctor sent to foreign media the actual numbers of Beijing residents struck by SARS did the party-state launch quarantine measures. The same indifference to the public good recurred in 2008 over the Sanlu dairy tainted milk supply scandal, which caused sickness or death to some 300,000 Chinese babies. There is a myriad of other examples. The Party still uses overwhelming force to suppress voices advocating the rule of law. One is Gao Zhisheng, a thrice Nobel Peace Prize-nominated lawyer. A decade ago, he was named one of China’s top ten lawyers. Party wrath was released when he decided to defend Falun Gong. It began with the removal of his permit to practise law, an attempt on his life, a police attack on his family, and a cessation of his income. It intensified when Gao responded by launching nationwide hunger strikes calling for equal dignity for all. One of his communiques described more than 50 days of torture in prison. that this is all that is being sought. He also mentioned the tragic loss of now almost 30 Tibetan lives to self-immolation. Nearly half a billion Chinese citizens now lack access to safe drinking water; many factories continue to dump waste into surface water. A World Bank study done with China’s environmental agency in 2007 found that pollution was causing 750,000 premature deaths a year. Coal now provides about two-thirds of China’s energy and it already burns more of it than Europe, Japan and the U.S. combined. Emissions from Chinese coal plants are now reaching well beyond China’s borders, yet the Party has failed to achieve anything substantive concerning the protection of water, air and soil. Many experts conclude appears that China cannot go green without political change. The state of public health across China today is highly worrisome. There is no health system for rural people and those not on state payrolls. Under the new privatized model, doctors, hospitals and pharmacies were made ‘profit centres’ and expected to finance their activities through patient fees. Less than a fifth of Chinese workers have pensions; even less are covered by unemployment insurance. The party-state meanwhile sits on trillions of dollars in foreign exchange holdings. What one is seeing in China is variations of what can only be called a Ponzi scheme. A local government, without a functioning system for raising tax revenue—and… riddled with corruption…sells development land to garner cash… (first getting) rid of (farmers) living on the land… The land will then be sold to a development company … owned by the local government…(T)he municipality has the power to instruct banks to lend the development company the money for the sale. So the local government gets its cash, the municipally-owned company gets to build a speculative residential or industrial complex, and all seems well. Yuan ($11,000) a square metre, which is about twice the annual income of the average resident. To finance a 150 square metre apartment in the building would consume every penny of a typical resident’s income for 350 years. There were 180,000 “mass incidents” in China in 2010, everything from strikes to riots and demonstrations, twice as many as in 2006. The regime continues to rely on repression and brutality to maintain itself in power. Universal values must be asserted continuously in dealings with Beijing. mass protests, strikes and civil disobedience. In all, authoritarian rulers were delegitimized and abandoned by their sources of support. A democratic China would not murder Falun Gong citizens in forced labour camps or engage in any of the other acts of gross misgovernance discussed above. Democratic governments and their business communities should examine why they are supporting the violation of so many universal values in seeking to increase trade with China. For years, this has resulted mostly in our jobs being outsourced to China and continuous increases in our bi-lateral trade deficits. Do those in our business communities overinvested in China feel no responsibility to the employment needs of fellow citizens? Are the rest of us too focused on access to inexpensive consumer goods and essentially ignoring the human, social and natural environment costs paid by Chinese nationals to produce them? • apply provisions for protection of the natural environment in all trade agreements in order to reverse the ‘race to the environmental bottom’ in China and elsewhere. The party-state in Beijing is making major changes in its senior personnel. Those appointed should seek dignity for all Chinese if they wish to achieve sustainable prosperity at home. Its current roles in Syria, Iran, Nepal, North Korea, Sudan, Taiwan, Zimbabwe and elsewhere will also require significant reform if the new government’s goal is to build international harmony with justice for all. The people of China want the same things as the rest of us: respect, education, safety and security, good jobs, the rule of law, democratic governance and a sustainable natural environment. If the party-state ends its violations of human dignity at home and abroad and begins to treat all members of the human family in a justly, the new century can bring harmony for China and the world. David Kilgour is a retired Member of the Canadian Parliament, former Canadian Secretary of State for Asia, a Nominee for the Nobel Peace Prize, and an unwavering voice in support of truth and human rights in many arenas. I received the following kind invite to head a panel in Ottawa next week. Very honored to share the podium with David Kilgour and Yiyang Xia. Is China’s rise peaceful or does the growing power of the communist nation represent a threat to its neighbours and their allies in the West? Are rule of law and human rights in China fantasies or a reality? At the lunch forum, Greg Autry, co-author of the book Death by China: Confronting the Dragon – a major new release from Prentice Hall that has proven to be influential in America policy circles – will discuss China’s tightly integrated economic, military, propaganda, and espionage strategies and the implications for Western governments and businesses. Mr. Autry will also discuss possible regional or global conflict that present significant, though often unanalyzed risks for Western firms and investors betting on China. Yiyang Xia, Senior Director of Policy & Research of Washington D.C. based Human Rights Law Foundation with special expertise in China will share his insights into China’s legal system, its subservient position to the Communist Party and the implication of that for basic human rights. Hon. David Kilgour, J.D., former Secretary of State for Asia-Pacific and a Nobel Peace Prize nominee jointly with David Matas in 2010 for the work they have done in opposing organ pillaging from Falun Gong practitioners in China, will speak on responsible engagement with China. Sponsored by: Mr. Scott Reid, M.P. ; Hon. Irwin Cotler, M.P. ; Mr. Wayne Marston , M.P. La montée de la Chine est-elle pacifique ou est-ce que le pouvoir grandissant de la nation communiste représente une menace pour ses voisins et ses alliés de l’Ouest? En Chine, la primauté du droit et les droits humains sont-ils des lubies ou une réalité? Lors du dîner forum, Greg Autry, coauteur du livre Death by China: Confronting the Dragon – un livre important nouvellement publié chez Prentice Hall et qui aurait influencé les cercles politiques en Amérique – parlera des stratégies économiques, militaires, de propagande et d’espionnage étroitement interreliées et de leur incidence sur les entreprises et les gouvernements occidentaux. M. Autry parlera également du conflit régional ou mondial que peuvent représenter les risques considérables, bien souvent non analysés, que courent les entreprises occidentales et les investisseurs qui misent sur la Chine. Yiyang Xia, directeur principal de politique et de recherche à la Fondation juridique des droits de la personne, à Washington D.C., expert de la situation en Chine, nous parlera du système juridique chinois, de son assujettissement au Parti communiste et de l’incidence sur les droits humains fondamentaux. L’honorable David Kilgour, J.D., ancien secrétaire d’État pour l’Asie-Pacifique et candidat au prix Nobel de la paix en 2010, conjointement avec David Matas, pour le travail qu’ils ont fait en s’opposant au prélèvement d’organes des membres du Falun Gong, contre leur gré. Il parlera d’un engagement responsable avec la Chine.